WHAT IS THE ENT FIELD ? What are the real benefits of seawater? In 1897, the French biologist René Quinton proved that there were similarities between the mineral composition of seawater and the interstitial milieu and blood plasma. He concluded that the human body must surely react well to treatments and preparations that contain substances from the sea. Sterilised seawater that has been matched to the molecular concentration of human plasma through dilution with sterilised water is called "Quinton Plasma". Therefore, isotonic marine plasma, thanks to its richness in vital soluble elements, is the physiological fluid of living things. Source: vitagate.ch. Eau de mer, Milieu organique” (Seawater: An Organic Milieu) publication date, 1904, Collection Science du Vivant, page 503. There are two different forms: isotonic and hypertonic. The prefix "iso" means equal. In medicine, a fluid is said to be isotonic when it has the same molecular concentration as blood plasma. In the case of a saline solution, this is equal to 9 parts per thousand of pure water. Therefore this isotonic concentration contains only a third of the salt content of water in oceans. Thus, if the fluid contains approximately as many molecules as blood plasma, this liquid is said to be isotonic. When this concentration is higher than 9/1,000, it is said to be hypertonic. Seawater has a concentration of 35/1,000. Hypertonic seawater has approximately 2/3 the salt content of regular seawater. Therefore, hypertonic seawater is purified, non-diluted seawater collected under special conditions at a certain depth in the ocean. The liquid is said to be hypertonic if the concentration of dissolved material is higher than that of blood. It can be administered parenterally, orally, or externally, notably for ENT problems and disorders such as sinusitis and rhinitis. 1.Arroll B. 2008. Common cold. BMJ Clinical evidence. Drinking seawater, not by the mouthful, but regularly consuming this purified liquid, voluntarily invigorates and re-mineralises the body. In ancient times, Hippocrates, Plato and Euripides had already extolled the benefits of seawater. "The sea washes away the evils of all mankind" Euripides (420 BC). In short, everybody should take sea baths. Certain thermal Roman baths were fed by seawater. Although in the 16th Century, Ambroise Paré recommended treating traumas with sea baths, it was not until the 19th Century that the idea to drink it came about. In fact, seawater contains all the components of the Earth and its inhabitants which feature in Mendeleev's periodic table. For those in favour of consuming seawater, it purifies the body and nourishes it with the elements it needs and which it is sometimes lacking, especially minerals. Its use is recommended either as a high-dose treatment to eliminate toxins, or as a long-term therapy to strengthen the organism. The problem is that seawater is salty. It contains 35g of salt per litre whereas we need only 9 g per day. Therefore, if we only drink seawater, (such as people who have been shipwrecked without resources) or too much seawater, our body will eliminate the excess salt and become dehydrated. Therefore, whether as a therapy or in case of shipwreck, certain precautions should be taken. The recommendations for shipwrecked persons emphasize progressive absorption, and advise mixing seawater with freshwater, in cases where they have managed to keep hold of some provisions. In this way, they will extend their freshwater supplies and their body will be less stressed. When people say that Alain Bombard, a voluntary castaway, survived without provisions, it should be noted that he caught fish from which he obtained water 1/3 less salty than seawater, and he also collected rainwater. There are two ways to benefit from seawater therapy. You can buy it in vials or take it directly from the sea. It can be consumed in two forms: isotonic or hypertonic. Vials of seawater are provided by different producers who collect it from the deep open sea, filter and then treat it so that any risk of contamination by any sort of pollution is eliminated. However, it is recommended to start therapy progressively. The doses can be increased when no adverse effects have been noted. Seawater can also be used as water for cooking. It should be noted that seawater consumption is not recommended in case of high blood pressure or hyperthyroidism. “Quinton Plasma” (isotonic seawater) is made from seawater collected 30 km from the coast, from a depth of 10 m. In shops, pharmacies and at the chemist’s, seawater, which is also called “seawater plasma” is sold in vials that can be taken one to six times per day. A high-dose treatment can be started with hypertonic seawater followed by maintenance with isotonic seawater. Of course, there are the other uses like nasal irrigation, baths and even injections in specific cases, which must be carried out under medical control. Consciously or not, we sense that the ocean is completely indispensable to us. Although much of this this “underworld” remains a secret to us, it bears our past and conditions our future. Scientists have confirmed that the sea possesses much of the Planet’s living diversity, but it is still largely unknown. However, human activities are now taking their toll on this enchanted world which is seriously threatened by global warming, coastal erosion, depletion of resources, pollution, and so on. What will become of the ocean, humanity's common heritage, if everybody who uses the sea, including fishermen, divers, ship owners and sports enthusiasts, do not learn to share and respect this living environment? Our origins are in the sea. They have been present on the blue planet for thousands of years, and will be for a long time yet. 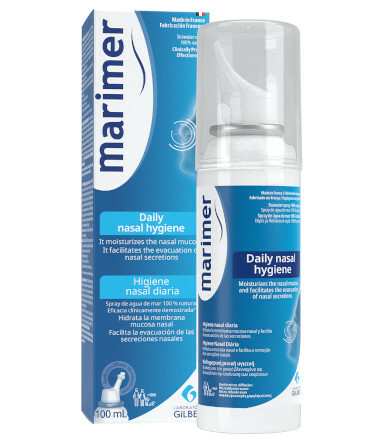 WHERE IS THE MARIMER PRODUCT RANGE MANUFACTURED? Pure 100% natural seawater is collected not far from Saint-Malo. Class IIa medical device – In Europe, these medical devices are regulated health products which bear, according to this regulation, the CE marking. Carefully read the instruction before use. Ask council to your pharmacist.